Perhaps no band in music history combined hard rock, progressive rock, boogie, and heavy metal like Uriah Heep. While they were never a darling of the music press, the band had and still maintains a loyal following, and has sold millions of albums worldwide over the years. 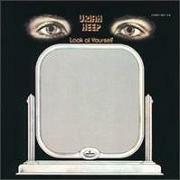 Their third album, 1971's Look at Yourself, was a precursor to the classics that would follow, namely Demons and Wizards, and The Magician's Birthday, but this release has always held a special place in the eyes and ears of this writer, and remains one of the early 70's best hard rock statements. The searing organ from Ken Hensley and driving guitar riffs from Mick Box kick off the classic title track, a heavy rock number that is five minutes of pure emotion, and one of Uriah Heep's most representative songs. An organ lovers delight, this churning hard rock masterpiece also features some amazing percussion at the end of the song courtesy of the band Osibisa, who guested on the album and added a nice flair to this crushing song. "I Wanna Be Free" is a stomp-and-boogie tune written by Hensley, with Box's thunderous riffs and Hensley's slide guitar passages being the key features, along with David Byron's shrieking vocals. The singer lays down perhaps his best performance on any Uriah Heep song on the timeless prog classic "July Morning", Heep's ten minute opus. Hensley's organ is just dripping all over this tune, using it as a rhythmic instrument as well as dropping in an inspired solo. Byron runs the gamut from emotionally tender passages to raging screams that rival Ian Gillan on the Deep Purple classic "Child in Time", and in fact this song is kind of like a distant cousin to that Purple staple. Manfred Mann guests on this track with some neat Moog passages towards the ending coda, which Hensley would later recreate live. More hard rocking boogie can be heard on the head-banging "Tears in My Eyes", led by Byron's powerful vocals and the duel guitar attack of Box and Hensley. Ken's slide guitar leads play off of Box's wah-wah solos to perfection, giving this tune a psychedelic, heavy blues sort of feel. Heep's trademark "heavy metal meets Beach Boys" harmony backing vocals are in rare form on this one, and act almost as a separate instrument, battling with Moog runs and slide guitar excursions. Perhaps the most bizarre track here is the eight minute "Shadows of Grief", a nightmarish song with wild vocals from Byron, sledgehammer guitar riffs from Box and busy Hammond organ courtesy of Hensley. The rhythm section of bassist Paul Newton and drummer Ian Clark (who would both leave the band after this album) work overtime here to provide the busy and complex backdrop to Box's wah-wah leads and the mighty Hammond passages. The eerie middle section features haunting vocal passages, creepy Hammond, and is quite frankly a bit scary and unsettling, matching Black Sabbath for doomy hard rock material from that era. "What Should be Done" slows things down a bit, letting Byron show off his tender side, accompanied by piano and guitar chords dripping wah-wah. The final piece on the album is a real barn-burner, the raging "Love Machine", a metal-meets-boogie rocker that is all about driving Hammond, heavy guitar riffs, shrieking lead guitar from both Box and Hensley, and the histrionic vocals of Byron. If there was ever a song that combined all the aspects of the Uriah Heep sound, it might be this one. Hensley gets to solo on slide and Hammond organ, Box's lightning wah-wah leads are in full force, and the sledgehammer rhythms are all there. At just over three minutes long, it's a fast paced and thunderous ending to a essential album. Uriah Heep would go on to record a multitude of strong albums, but Look at Yourself will always remain a testament to their versatility, and also proved just what an important and talented musician/writer Ken Hensley was fast becoming. "...Don't be afraid, just, Look at Yourself!"